This page will help answer your questions! We will be constantly working out the details as the ride approaches, and updating you regularly with our periodic email newsletter. Contact us at if you don't find your answer. 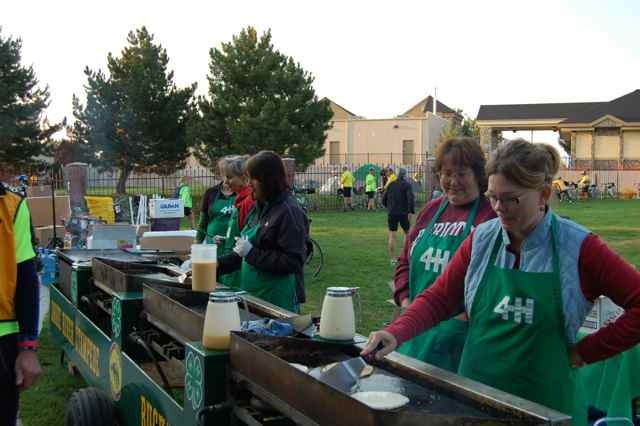 In order to support the local economies, your registration fees are used to pay the organizations that supply our meals, luggage handling, entertainment and other needs of Ride Idaho's participants. In addition, when funds allow, Ride Idaho makes contributions to the communities that host our event. Sometimes it's a direct monetary donation, other times it's paying for services, tours, ride support, special activities. Ride Idaho also makes contributions that meet the communities specific needs, first-responder safety equipment, park benches, athletic equipment and band instruments to name a few. See the Giving Back page for more information. Is there a shuttle for me and my bike? This year’s ride is a complete loop so there will be no need for shuttle service. Transportation to and from camp is addressed on the Getting There page. I am a first time rider. What can I expect? Ride, Eat, Sleep! Oh yeah, and you will have fun too! We welcome a number of new riders every summer, so you certainly won't be alone. The camaraderie on our ride is very welcoming and helpful, so there is always someone to give you a hand when you need it. The Ride Details pages of our website have some helpful information, and the Training Program has been proven to be ample preparation by other first-timers. If you are looking for something you can't find, call or send us an email at: We're always happy to assist you! You can connect with other riders in your area, and be involved in the Ride Idaho community through our Ride Idaho Facebook page. Like our page and make sure to mark that you want to receive notification of our posts. How do I prepare for the ride? A well-rounded training program will help to make Ride Idaho a wonderful experience. Good nutrition and overall fitness are key. Begin with shorter rides, back-to-back, and increase to longer days in the saddle. You will want to work on climbing, first by doing small hills and rollers, working up to longer hills with no rests. If possible, ride with other cyclists who are preparing for an event. You will be more motivated to ride longer, and more often if you have a group to train with. This will also help you to be comfortable riding in a group. Check out your local riding clubs. A good resource in Boise that provides Ride Idaho tour training, is Boise Community Bicycle Rides, at www.communitybicyclerides.org. Ride Idaho contracts with community organizations to provide our meals. These folks showcase the local culinary fare, and are happy to provide a vegetarian menu option. Since our event is small and not formally catered, we are unable to guarantee meals for riders with other special dietary needs (such as gluten-free, lactose-free, or for other specific allergies). In the past, gluten-free riders have been able to manage their needs with the variety of foods we supply. We recommend that riders with special dietary needs bring a variety of supplemental snacks if necessary. What time do we ride each day? All cyclists MUST be on the course by 8 a.m. The course opens at 6:45am and SAG vehicles operate from 7:30am to 5:00pm. Riders all have their own pace, which has been taken into consideration when establishing the routes and the route support hours. If you anticipate being unusually slow, please talk to us. We will assist you in making your ride a success. If you are feeling drained and aren't sure if you can continue, signal to a SAG (support and gear) vehicle who can help you refuel, provide first aid and equipment support, or give you a ride into camp. SAG vehicles can transport cyclists due to mechanical, medical, or fatigue issues. The vehicles will have extra water, snacks, tire pumps and first aid. SAG vehicles are signaled with a “thumbs down” sign. What if I have mechanical problems? There will be bike mechanics along the route each day, and in camp every night. If you need their help on the road, a SAG driver will take you to them or you can signal to them with the “thumbs down” sign. For your safety and comfort, we encourage you to have your bike professionally fitted and completely tuned up prior to the ride. Your luggage will be traveling by truck after being loaded by people. People who will be lifting your bags. When packing, please keep in mind that YOU must be able to carry your bags to and from the luggage truck. It may be easier for you to bring two bags with a combined weight of 60 lbs. All of your gear must fit inside the bag. Nothing may be tied to the outside of your bag. All riders will receive two baggage tags and must have their bags packed and at the luggage truck no later than 7:45 am each day. You won't have access to the luggage truck while on the road, so you will want to carry any items you need along the way, such as rain gear, camera, or snacks. SAG vehicles and Rest Stops will collect any outerwear shed after the day warms up. These articles will be tagged and can be picked up at the campsite each evening after the ride. See GETTING READY / WHAT TO BRING. Is there a tent and porter service available for the ride? Yes, the Good Grief Tent & Porter service will be available. Follow the link for more details. Yes, however some communities along the route may have very limited or no accommodations available. We will post some locations for your convenience; however, it is your responsibility for reservations, payment and transportation to and from your reserved accommodations. Click on the specific day that you would like lodging suggestions for, and scroll to the bottom of that day. Yes. Many of our riders have family or friends who want to join the event, but not ride a bike. Guests are welcome as non-participants, but not as route support. Ride Idaho provides route support for every mile of the ride. Any extra vehicles on the route defeats the purpose of selecting less traveled roads. Non-Rider/Guest: The cost of $625 includes camping space, meals, showers, and entertainment. For the safety of our cyclists, guests will be asked to drive an alternate route to our next destination when one is available. Volunteer: Ride Idaho is always looking for fun, friendly, energetic individuals to contribute as volunteer workers. The success of our ride is dependent on the hard work of our volunteers. If your guest chooses to volunteer for the week, we will waive their registration fee. Can I bring an RV or a Camper if I have a guest to drive it? We make every effort to allow space for RV parking at the campsite. However, we do not guarantee there will be adequate space for RVs. If you choose to bring an RV, you will be responsible for finding the necessary services, and possibly parking, on your own. In most cases, we have a list of available RV parks listed at the bottom of each daily route page on this website. Please note: rider/non-rider vehicles are not allowed to drive the cycling route. Ride Idaho provides support every mile of the route for the riders. Guest vehicles will be asked to drive an alternate route to the campground each day. Is there parking available for the week of the event? Yes. Long term parking will be available. Click here for details. Yes, check under the Ride Details/Getting There section of the website. Will I have phone/e-mail access during the ride? Will I be able to charge my electronic devices? Not all of the mountainous areas we pass through have uninterrupted cell phone and Internet access. Some campsites have electrical outlets available, however the first priority will be for the logistical needs of the ride. New started in 2013! Our SAG team, The Voice of Idaho, Amateur Radio Club, will provide a charging station each day in camp for a fee. Please read the newsletter you will receive via email for more information. Will there be electricity at each nights camp? We cannot guarantee that electricity will be available each night. Most of our camping is in city parks which may or may not have electricity available. For a nominal fee, our HAM operators provide a charging station. Ride Idaho does not allow cyclists to bring any pets with them. Volunteers and Non-Riders can bring a pet under these specific conditions. The pet can not be in camp around the riders or at a rest stop outside of a vehicle, other than to go to the bathroom. The pet must be on a leash when being walked. Please be aware that pets may not be allowed at the campsites per park or city regulations. Pets must be leashed and under control or resting in a vehicle at all times. Be aware that temperatures during the ride may be too hot for prolonged periods of time inside a vehicle. The privileges Ride Idaho receives from our hosts has been earned. Please don't jeopardize the good karma we've developed. Can I tow a bicycle trailer? We do not allow riders to tow anything behind their bicycle for safety reasons. What about recumbent, 3-wheeled or tandem bicycles? Yes. We welcome recumbents, recumbent tricycles and tandems. Can children come on the ride? Children ages 12 to 16 years can register to ride on a tandem with a consenting adult guardian. Ages 16 through 18 years may register for the ride with the written consent of their parent or guardian, who must also be registered. Non-riding children, accompanied by a parent or guardian, can register as a guest. Will we be sharing the route with motorized traffic? All roads remain open to the public during our ride. We make every effort to utilize secondary roads with lower traffic volume. We make efforts to engage local agencies to support our event and create awareness. We also post signs in key areas each day to notify motorists of our presence. Ride Idaho works hard to spread the word of "Share the Road". This concept applies to bicyclists and any other user of the road. Please refer to Cycling Etiquette and Safety link. Can I ride for just a couple of days instead of the full week? We will not be offering segment rides for Ride Idaho. Can I wear headphones and listen to music while I ride? In consideration of safety for yourself and other cyclists we strongly discourage listening to music while riding. Do we stay on paved roads? We remain on paved roads or bicycle paths whenever possible. That being said, participant safety is a considerable factor when route planning. There are occasions when a small stretch of gravel is safer than a busy road. Sometimes the access roads to our camping locations are not paved. Will massage service be available? Shelly and team will be back again this year to give you some real relief during the week. Their caring hearts and hands are much appreciated by riders and staff. Stop by their tent on Saturday to set your schedule for the week. While you're there, book one for a friend too! NOTE: It is the participant's responsibility to coordinate scheduling and payment for massages, they are not included in your registration.